Asthma is a common chronic disease of the respiratory tract that can affect people of all age groups and almost every part of the world imposing substantial economic and health burden. It is a disease characterized by recurrent episodes of breathlessness, cough, wheezing, chest tightness that vary over time in their occurrence, frequency and intensity. It is an inflammatory disorder that causes swelling of airways lining thus narrowing of airways and reduced expiratory air flows. Today is World Asthma Day, observed every year to bring focus attention on this chronic illness. Read more about the causes, symptoms and treatment of asthma. As per WHO, 235 million suffer from asthma and about a tenth of them living in India. Asthma is the commonest chronic disorder among children with an estimated prevalence of 3-38%. The disease causes limitations in daily activities, loss of school and work days, lung function impairment, reduced quality of life, and an adverse socioeconomic burden. There are about 489,000 deaths attributable to asthma annually and the majority of deaths occur in low- and middle-income countries. It is often caused by a combination of genetic and environmental factors including inhaled allergens and pollutants. 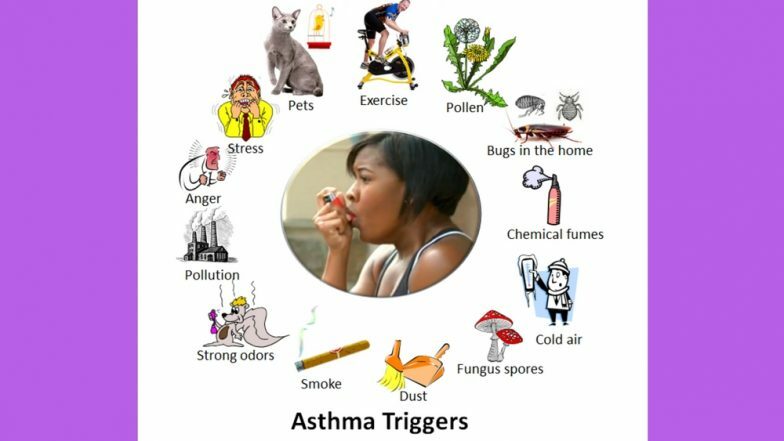 Factors that may trigger or worsen asthma symptoms include indoor allergens (for example house dust mites in bedding, carpets and stuffed furniture, pollution and pet dander) outdoor allergens (such as pollens and moulds) tobacco smoke, chemical irritants in the workplace, air pollution. Some drugs can induce or trigger asthma, e.g., beta-blockers, and (in some patients) aspirin or other NSAIDs. A seasonal variation of asthma is a well-recognized feature. For instance, incidence and mortality of asthma, general practice episodes, and hospital admission all vary by seasons. With the Arrival of spring season comes warmer temperature, new flowers and plants blossoms leading to a rise in pollen in the air causing a surge in asthma attacks. The increase of outdoor activities and higher temperatures may account for some of the reduction of asthma occurrence in the warm months. However, Onset rainy and winter season causes wide fluctuations in temperature along with cold moist environment leading to the growth of moulds and fungi that are potential triggers of Asthma. Asthma can be diagnosed with recognizing symptoms and with help of some objective tests like spirometry. Although Asthma cannot be cured, but it can be treated effectively with by appropriate medicines including inhalers, nebulizers and other bronchodilators. Recognition and avoidance of potential allergens, Regular exercise, good personal and environmental hygiene can significantly reduce the episodes of asthma in patients. The theme of World Asthma Day 2018 is "Never too early, never too late. It's always the right time to address airways disease." The theme provides a call to action for both patients and healthcare providers worldwide to evaluate symptoms regardless of the timepoint in one’s life they may occur and take actions to ensure that the asthma is controlled.